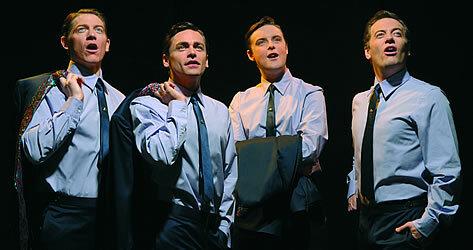 Guide to the London stage musical "Jersey Boys"
This page is a brief guide to the stage musical Jersey Boys. It is currently being staged at the Prince Edward Theatre in London's West End. 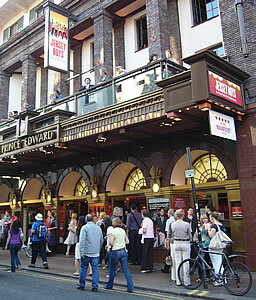 The Prince Edward Theatre is in Old Compton Street, London W1D 4HS (nearest Tube: Tottenham Court Road or Leicester Square). It is at the junction between Old Compton Street and Greek Street. Frankie Valli: the lead singer (tenor) of The Four Seasons. 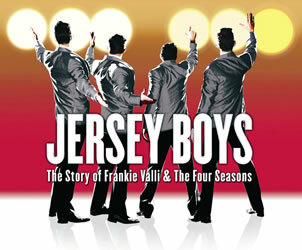 The musical is based on the true life story of the members of the American group The Four Seasons, including its lead singer Frankie Valli. Frankie Valli and the Four Seasons were hugely successful in America, where they had a long string of major hits, especially in the sixties. They were less successful in Britain but still managed seven top ten hits including a number one ("December 1963"). The stage musical starts with a cover version of December 1963 (Oh what a night) in French. The title is "Ces soirées-là" and the artist is Yannick. This was a hit in France and West Africa in 2000. Below are some of the words to some of the Four Seasons songs which are featured in the musical. The years in which the songs were first released are shown in brackets. Click on the links to listen to original versions of the songs. I could love you but why begin it? Can't take my eyes off you. Pardon the way that I stare. What a lady! What a night! In the room. Yeah! Oh my! It seemed so wrong, but now it seems so right. Spinning my head around and taking my body under. English: The story is simple and easy to follow. American accents are used. There are short sections of speech between songs: these are quite quickly spoken and include some slang, but if you don't understand everything it shouldn't prevent you from enjoying the show. Age: Suitable for adults of all ages and for teenagers. The language used includes some swearing and mild sexual references. Children under 12 are not admitted. If you are over 60 you may remember when the original songs were released. People of all ages will be familiar with many of the songs - if you don't know the original Four Seasons songs you will probably have heard some of the many cover versions. Music: The actors are musicians and perform all of the songs live on stage. You will enjoy this show if you like 50's/60's rock 'n' roll music. The tunes are very catchy and most are sung as four-part harmonies.